Do movies always reflect the national mood? A recent study of IMDB.com data by researcher Bo McCready may support that case. The German philosopher Georg Wilhelm Friedrich Hegel called it Geist der Zeiten; that’s “the spirit of times.” Over the years, we’ve shortened the phrase to zeitgeist as a reference to forces or coincidences that dominate or emerge at particular points in history or culture. You can find flashpoints in literature or film where prevailing themes took over and a number of stories that hit the same plot buttons emerged, all commenting on or reflecting the times in which they were created. 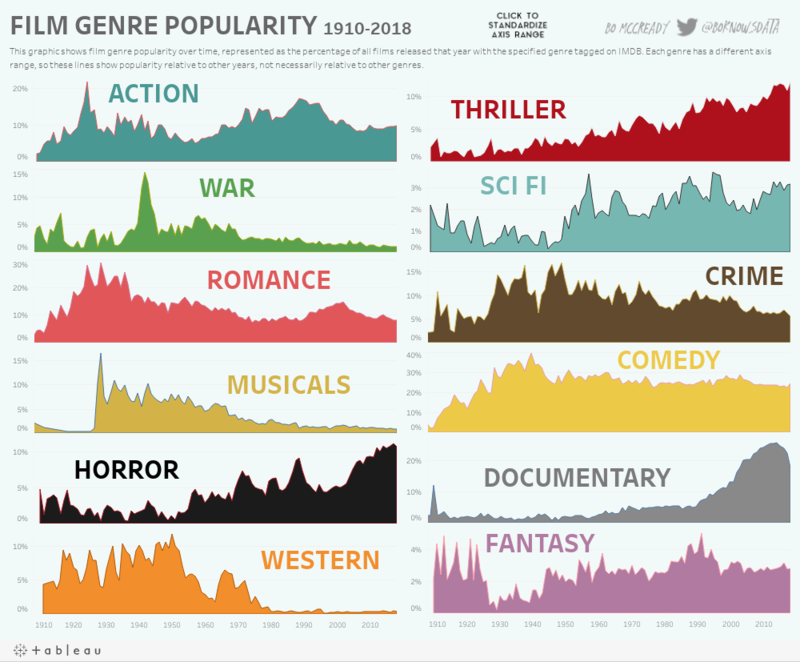 A recent study by researcher Bo McCready examines the popularity of different film genres across the decades, and his statistical analysis gives us an interesting window in the national mood of the United States. The notion of tying current events or general trends in culture to the popularity of films isn’t a new idea; in fact, it’s a staple of film criticism and serious writing about literature. In his 1981 non-fiction book on the horror genre, Danse Macabre, Stephen King discusses these ideas at length, particularly in the chapter called “The Modern American Horror Movie—Text and Subtext.” King suggests that cultural connections can power popularity, noting that The Exorcist blew up at a time when tension between adults and teenagers was particularly high (in the early 1970s during the Vietnam and Peace Movement eras), while The Amityville Horror reflected fear of losing a house during times of economic uncertainty. King also notes that other countries might have different concerns that produce different effects, such as the social paranoia of 1970s West Germany manifesting in the popularity of Dawn of the Dead there. Similarly, film historian and author David J. Skal has written about a number of social connections through the decades. In his book, The Monster Show, he draws parallels like the explosion of Universal horror films during the early years of the Great Depression, the rise of science-fiction horror during the Cold War and Space Race of the 1950s, and the resurgence in the popularity of vampire films during the AIDS crisis of the 1980s. These connections aren’t just limited to the horror genre. As Skal notes, war films generally attract more attention in wartime. The Western boom of the 1950s and their optimistic view of “manifest destiny” and the nation’s expansion coincided with a positive American self-image after World War II. The more intense and complex dramas of the early 1970s sprang from the turmoil of the Vietnam era. The runaway success of films like Star Wars reacted against the post-war malaise that afflicted both the American mood and economy in the latter half of that decade. Today’s apparent super-hero dominance at the box office is driven in part by the fact that special effects finally caught up to what you see on the comic book page, but is also powered by a combination of clearer hero/villain narratives in an increasingly complicated world. McCready is used to following numbers, but the stats that surprised him were his own. When he tweeted the graph of his findings, he didn’t realize that he was about to go viral. The interactive version has more than 170,000 hits, and the image version made the front page of Reddit. While it’s easier to find examples of how these film comparisons play out over time, we can still sense how certain trends are happening today. Of particular note is the sheer number of films that attempt to reckon with the country’s record on race. From Get Out to Green Book, from Black Panther to BlacKkKlansman, a larger number of movies grapple with that difficult topic from a variety of perspectives. The success of these films and others, like Crazy Rich Asians, demonstrate that the movie-going public is not confined to one audience and is in fact hungry for different American experiences receiving representation. Even if you agree with McCready’s premise that no number is perfect, it’s still interesting to see how the popularity of genre lines up with certain decades (westerns with the 1950s, for example) or how some are doggedly consistent (the percent of comedies is remarkably consistent since 1949). Whether it sets out to or not, art always ends up reflecting the time in which it was created. No matter what genre is popular in which decade, we’re always going to have a better understanding of ourselves when we consider what entertains us, and why.